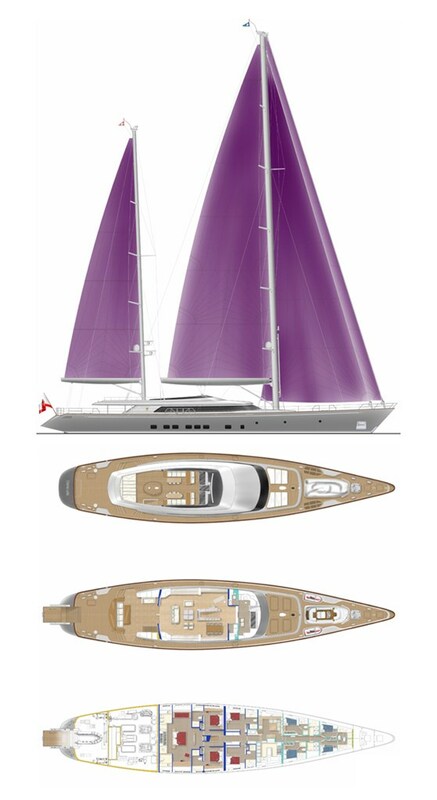 First of the aluminium-hulled 50m series with minimalist interiors by the iconic designer John Pawson, S/Y Baracuda is immediately recognizable for its striking violet sails. Built for a very experienced owner, the yacht has raced successfully in several Buckets. Baracuda makes a strong visual impact primarily by the color of the hull which is metallic grey with shades of gold and her billowing sails which are flaming purple. This contemporary appeal is also echoed in the portholes, which are an unusual rectangular shape. Baracuda’s expansive main deck is 22 meters in length from the aft sunken cockpit through to the inner wheelhouse. The extended windows provide natural lighting and panoramic view. The main deck is conceived as open living space, with no partitions, with the aim to keep a clear, unencumbered visual field than is conventionally the case on sailing yachts of this type. Another feature unique to Baracuda is that her transom can be cleverly opened to transform into a large platform for both tender launching and swim access. This swimming platform can be submerged 8 inches below the water's surface and is accessed by guests via a staircase on the aft deck.